Andy Murray sealed perhaps his greatest triumph by ensuring Great Britain beat Belgium to win the Davis Cup for the first time since 1936. A straight sets win for Murray over Belgium's David Goffin secured an impregnable 3-1 lead for the British team in the best of five final, and an astonishing achievement that caps the 28-year-old's stellar tennis career. Five years ago the British Davis Cup team suffered a humiliating defeat to Lithuania and faced relegation to Europe/Africa Zone Group III, the lowest tier of tennis' team competition. The notion that by 2015 the Davis Cup would be won by a country which has, for decades, struggled to produce tennis players who can rank among the world's top 100, was a fanciful proposition at that low point. But Glasgow-born Leon Smith was subsequently appointed as team captain and, with Murray not always available to play as Britain waded through the lower reaches, his fellow Scot guided them back up to the World Group. 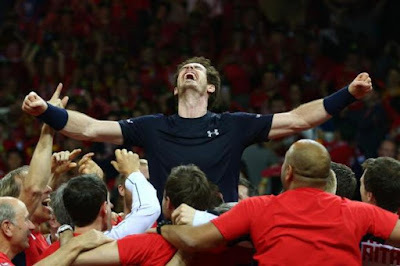 Once promoted to the elite, Smith was able to call upon Murray, a double grand slam-winning diamond in the rough whose presence was key to the nation reaching their first Davis Cup final since 1978. Having won his singles rubber on Friday to level the final at 1-1 after Kyle Edmund was defeated in the opener, Murray clinched the key doubles match on Saturday with his brother Jamie, their third win from three ties played together in the competition, to set up the decisive showdown with Goffin on the Ghent clay. Currently ranked world number two, Murray came out on top on Sunday with an assured 6-3, 7-5, 6-3 scoreline to further carve his name into tennis history. With world number 100 Edmund and number 156 James Ward also part of the team for the final, there can be little doubt that Britain's 10th Davis Cup success was mostly the work of one family, if not one man. Having won Olympic gold at London 2012, followed by his first grand slam at the 2012 US Open, then the holy grail of Wimbledon in 2013, the younger Murray has now added the Davis Cup to his glittering list of tennis achievements. Perhaps most remarkably, though, he has in many ways given lie to the addage that individuals don't win, teams do.